Getting a guaranteed income stream could give you the freedom to take a little more risk elsewhere. For those concerned they might outlive their assets, annuities can provide a guaranteed income stream. But for those who go this route, a big question remains: How should your annuities affect the rest of the portfolio? In general, investing professionals say that putting part of one’s nest egg in annuities can open the door to taking on more stock-market risk, which in turn offers the possibility for more portfolio growth. Matt Grove, a vice president at New York Life Insurance Co., who heads the company’s annuity business, says owning annuities can allow investors to increase their risk exposure in part because annuities are so different from conventional securities. For instance, there are types of annuities that provide a set monthly check for life and that are completely independent of the ups and downs of the stock market, he says. And mixing uncorrelated assets is a key strategy in managing portfolio risk, whether you are talking about annuities or simply diverse types of securities. Brett Wollam, senior vice president at Fidelity Investments’ life-insurance unit, suggests retirees use income annuities along with Social Security and pensions to fund their essential expenses. When there are several sources of guaranteed income, retirees can invest more in products with growth potential than they might have otherwise, he says. “Typically, investors are too conservatively invested” in retirement, Mr. Wollam says. Fidelity Investments Life Insurance Co. sales manager Robert Cummings gives an example of a 60-year-old couple who changed a portfolio that was invested largely in cash to one with a 45% allocation to two annuities and a 28% allocation to equities. The couple weren’t knowledgeable about the stock market, but they knew longevity ran in their families and were concerned about inflation, says Mr. Cummings. “Both factors speak to the need for growth because of the time horizon they are planning for,” Mr. Cummings adds. The couple’s annuities now include a $200,000 deferred-income annuity from New York Life with a $1,057 monthly payout starting in five years. Of course, not all annuity purchasers should increase their exposure to stocks. To some degree, the decision depends on the investor’s risk tolerance and the types of annuities he or she owns. With variable annuities, the value of the contract can fluctuate with stock and bond prices. At the same time, fixed-payment annuities could involve risk if the issuer is on shaky ground, or if the annuity lacks automatic increases to protect against inflation. 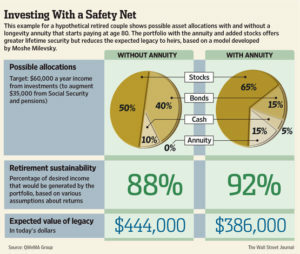 In some cases, in fact, annuities may help an investor ratchet back too great a stock exposure. At Steele Financial Solutions in Cherry Hill, N.J., Joel Steele recommended that a 61-year-old client with 100% of his portfolio in equities reduce his risk exposure and invest in deferred-income annuities. The client had booked some recent gains in stocks but was generally frustrated with the continuing ups and downs of the market, Mr. Steele says. Even with the recent gains, he adds, the client’s portfolio was only back where it had been 10 years earlier. The client also was anxious that his pension wouldn’t provide enough income for his wife in the event of his death. At Mr. Steele’s recommendation, the client invested half of his assets in two deferred-income annuities with guaranteed monthly payouts starting in two and 15 years. Of the remainder, he has 17% in stocks and the rest in income-producing bond funds. Moshe Milevsky, an associate professor of finance in the Schulich School of Business at York University in Toronto, says that for income protection in later life, the best annuities are those that delay payments at least until the purchaser reaches his or her 80s. The payouts for these types of annuities tend to be bigger than for annuities whose payments start earlier, but many potential investors see the long wait as too much of a gamble. Indeed, these products, generally referred to as advanced-life delayed annuities, or longevity insurance, have proved a hard sell for the insurance companies that offer them. But according to Mr. Milevsky, delayed payouts enable purchasers to allocate more of their portfolios to investments with higher growth potential, compared with purchasers of annuities that start their payouts within a few years. Mr. Milevsky is also founder of QWeMA Group Inc., a developer of products for wealth management, investing and insurance, with a focus on retirement income planning. Based on algorithms that he has developed, the company, whose name is an acronym for Quantitative Wealth Management Analytics, recommends mixing longevity insurance and mutual funds as a strategy for protecting income in later life.